Fig. 2. 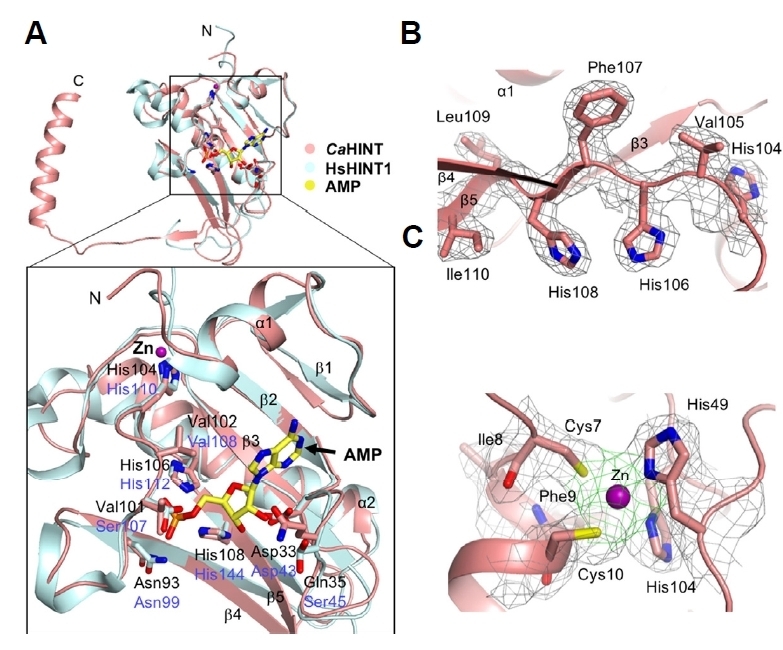 (A) Overlaid structures of CaHINT and HsHINT1 in complex with AMP (PDB ID: 3TW2) are shown in the upper panel. The detailed interactions are indicated in the lower panel with a black box. Structures and residue-labels of CaHINT and HsHINT1 are colored in salmon and light cyan, respectively. The AMP molecule and zinc ion are shown in yellow and purple, respectively (HsHINT1: human HINT1). (B) The histidine triad motif of CaHINT. The 2Fo-Fc electron density of the histidine triad motif, including the residues His104, Val105, His106, Phe107, His108, Leu109, and Ile110 of CaHINT, is shown at the 1.0σ contoured level. (C) Zinc binding motif of CaHINT. The 2Fo-Fc electron density for the zinc binding motif (Cys7-Ile8-Phe9-Cys10) and two histidines from the histidine triad contoured at the 1.0σ level. The density of zinc (purple) interacting with the side chains of Cys7, Cys10, His49, and His104 and the main chains of Ile8 and Phe9 is highlighted in green.